Running for refugees: Bonita Choi in Namibia | Photo: BonitaHello! I don't know about you but I have been captivated by the media coverage of yesterday's 40th Anniversary of man's landing on the moon. The courage and dedication of the astronauts boggles my mind. Recently however, I got to witness astronaut-like dedication in a brave young volunteer who deliberately chose a tough road - actually, a tough run across the second oldest desert in the world! Meet Bonita Choi, the 25 year old financial analyst from Hong Kong who completed a seven-day, 250km endurance run in May so that she could help the helpless! Me and the little angel Xiao Mou, who is now in heaven. I'm usually giving you happy news about our work, and today is no exception, but to be balanced, I should also tell you about the distressing side. Here's more good news for you about our little girl, Xiao Shan, who was generously given two cochlear implants (see Xiao Shan's Story). On Sunday June 21st, she came to my church which is near the water, where she enjoyed the scenery and the sea breeze which she doesn't have in Xining. We all prayed for her because she'll be going to Beijing today, July 7th, to begin two years of speech therapy! Young Presidents' Organization Is Impressed! Young Presidents' Organization representatives and their families brought joy to orphans in our Xining Children's Home earlier this month. They have also promised much needed fundraising help ! Our Administrator Mum is Outstanding! I spent last week at our Xining Children’s Home in Qinghai Province, and I felt I must introduce you immediately to a very special lady. 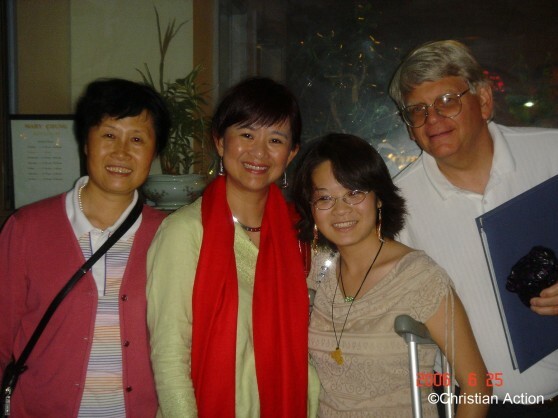 Madam Li Yonglian was the Administrator when Christian Action was invited to co-manage the home in 1998. Since then she has won many Awards, including the Civil Affairs Bureau’s Outstanding Worker Award 2001 and the China Worker’s Association’s Outstanding Administrator Award 2007. After working with Madam Li for 11 years I know that if there was an Outstanding Mother Award, she would have won that too!